There are different varieties of cocoa beans, and the most common include the Forastero, Trinitario, and the Criollo. Forastero is native to the Amazon basin, and it accounts for nearly 80% to 85% of the world’s cocoa production. Criollo is a very high-quality and rare cocoa bean that is quite expensive and is used in luxury chocolate. It is native to South and Central America, and only accounts for about three percent to five percent of the world’s cocoa production. Last but not least, trinitario came into existence after a hurricane nearly destroyed the criollo crops of Trinidad in 1727. Today, the trinitario is commonly found in the Caribbean, Colombia, and Venezuela, and it accounts for around 12% of cocoa production in the world. Whatever the variety, there are many potential cocoa powder health benefits. Cocoa powder is said to reduce high blood pressure, lower heart attack risk, reduce depression, treat asthma, improve blood flow to the brain, boost HDL, or the “good” cholesterol, and more. What are the cocoa powder nutrition facts? One cup of cocoa powder is absolutely loaded with nutrition, and contains a good amount of carbohydrates, fiber, fat, and protein. It is especially high in fiber, with 114% of your recommended daily value. From a mineral perspective, cocoa powder is also high in manganese, copper, magnesium, phosphorus, iron, potassium, zinc, selenium, and calcium. It also contains some vitamins, such as vitamin B1, vitamin B2, vitamin B3, vitamin B5, vitamin B6, folate, choline, and vitamin K.
The following is a comprehensive nutrition chart for one cup, or 86 g, of unsweetened cocoa powder. There is a reason why Theobroma cacao translates as “food of the gods.” It is because it is loaded with health benefits that could absolutely prolong your life. Polyphenols are antioxidants that are present in particularly high amounts in cocoa powder. Polyphenols have been found to improve blood flow, reduce inflammation, improve cholesterol levels, and lower blood pressure. The health benefits of cocoa powder are also due to the impressive nutrition profile we’ve noted above. It is no surprise that cocoa powder also contains anti-inflammatory, antidepressant, antibacterial, cancer-protective, and anti-diabetic properties as well. Read on as we take an in-depth look at these many cocoa powder health benefits. One of the better benefits of cocoa powder is its ability to reduce high blood pressure. The blood pressure-lowering effect of cocoa was first noted in Central America, where the island people who drank cocoa had lower blood pressures than the non-cocoa drinkers. The flavanols are polyphenols in cocoa that are thought to improve nitric oxide levels in the blood, and this can enhance blood vessel function and lower blood pressure. A review that analyzed 35 experiments, published in the journal Critical Reviews in Food Science and Nutrition in 2016, found that cocoa produced a significant blood pressure reduction of 2 mmHg (millimeters of mercury). The blood pressure-lowering effect was greater in people with high blood pressure than those with normal blood pressure. The effect was also better in older adults than in younger individuals. It is important to note that processing significantly lowers the flavanol content in cocoa; therefore, the antihypertensive effects will likely not be found in your average chocolate bar. In addition, cocoa power may also reduce your risk of strokes and heart attacks. As mentioned, the flavanols in cocoa improve nitric oxide levels in the blood, which also dilates and relaxes your blood vessels and arteries to improve blood flow. As a result, cocoa powder can reduce your cardiovascular disease risk, including the risk of a stroke or a heart attack. In a review of nine studies and 157,809 people published in the journal Heart in 2015, researchers found that higher cocoa consumption was linked with a significantly reduced risk of heart disease, stroke, and death. This further suggests that frequent consumption of small amounts of cocoa-rich chocolate may benefit your heart and reduce your risk of stroke and heart attack. High cholesterol is another risk factor for heart disease. Cholesterol isn’t bad in general, and is needed in moderation for proper function of your nerves, cells, immune system, hormones, and brain. Lipoproteins are needed to transport cholesterol through the blood of the body. LDL (low-density lipoprotein) carries cholesterol from the liver to the cells that need it. HDL (high-density lipoprotein) picks up the excess cholesterol from the cells and brings it back to the liver, where the cholesterol is then broken down and excreted from the body. The problem is when the body creates more cholesterol than the HDL can remove from the cells, and the extra cholesterol remains in the blood. The cholesterol becomes oxidized, especially the LDL cholesterol, and attaches to the artery walls and leads to inflamed arties. Cocoa has been found to reduce LDL, or “bad” cholesterol, while also increasing HDL, or “good” cholesterol levels. This was confirmed in one 2007 study where Japanese researchers reported that drinking cocoa daily may boost HDL cholesterol levels. In the 12-week study, the men in the cocoa group showed a 24% increase in HDL cholesterol, while HDL had only increased by five percent in the control group that drank a sugary beverage without cocoa. The LDL cholesterol of the men who drank cocoa was also more resistant to oxidation than that of the men who didn’t consume cocoa. The polyphenols found in cocoa may also decrease your risk of neurodegenerative diseases, and they do this by improving blood flow and overall brain function. The flavanols, in particular, can produce neurons and important molecules needed for brain function. In addition, we know that flavanols influence nitric oxide production, and this relaxes blood vessel muscles and improves the blood supply and blood flow to your brain. A two-week study published in the journal of Neuropsychiatric Disease and Treatment in 2008 found that high-flavanol cocoa increased blood flow to the brain by eight percent after one week and 10% after two weeks in 34 older adults. Other studies suggest that cocoa can reduce age-related cognitive dysfunction in elderly adults, and consequently, cocoa may have positive effects on neurodegenerative diseases like Parkinson’s disease and Alzheimer’s disease. In addition to reducing age-related brain degeneration, cocoa may also improve mood and reduce depression symptoms. The positive effects on mood may derive from the flavanols in cocoa (as well as the sensory pleasure of eating chocolate), its caffeine content, and cocoa’s ability to convert tryptophan to serotonin—a natural mood stabilizer. Research suggests cocoa has a positive effect on mood and treating depression. In a study published in the European Journal of Clinical Nutrition in 2008, scientists found that eating cocoa was linked to improved overall health and psychological well-being in senior men, including reduced feelings of loneliness. Another study published in Neuroscience and Biobehavioral Reviews in 2013 found that cocoa also improves mood, calmness, and contentment. Although too much chocolate is not good for blood sugar levels, cocoa powder actually does have anti-diabetic effects. Research published in the journal Antioxidants in 2017 indicates that cocoa flavanols can improve insulin secretion, slow down carbohydrate absorption and digestion, and stimulate sugar from the blood into the muscles. Studies show that a higher flavanol intake from cocoa can lead to a reduced risk of type 2 diabetes as well. A review of human studies also shows that eating cocoa or flavanol-rich dark chocolate can lower insulin sensitivity, reduce inflammation, and improve blood sugar control in both non-diabetic and diabetic people. These results suggest that cocoa polyphenols may have a positive impact on the prevention and treatment of diabetes. The polyphenols in cocoa have been reported to interfere with the progression of cancer. Polyphenols like the flavanols in cocoa powder are responsible for many of its cancer-protective properties. Research shows that the polyphenols in cocoa inhibit cell growth, fight inflammation, protect cells against damage, prevent the spread of cancer, and induce cancer cell death. Animal studies also show that cocoa extracts or a cocoa-rich diet can help reduce incidences of prostate cancer, pancreatic cancer, breast cancer, colon cancer, and liver cancer, and also leukemia. Human studies also suggest cocoa consumption is associated with a reduction in cancer risk. A review published in the journal Nutrition and Cancer in 2009 indicates that the antioxidant effects of cocoa may help prevent cancer, too. Asthma is a common respiratory disorder that causes inflammation and obstruction of the airways, and common symptoms include chest pain, shortness of breath, coughing, wheezing, and mucus production. Cocoa is thought to benefit people with asthma due to compounds like theophylline and theobromine. Theobromine is considered similar to caffeine, and it may help relieve frequent bouts of coughing. Theophylline, on the other hand, will help dilate your lungs, reduce inflammation, and relax your airways. Animal studies show that cocoa extract can decrease both tissue thickness and constriction of the airways, and this suggests cocoa may be used in the treatment of asthma. A number of studies have explored the protective effects of cocoa against gum disease and dental cavities. The antibacterial, immune-stimulating, and anti-enzymatic properties of cocoa may benefit oral health overall. One study published in the journal Critical Reviews in Food Science and Nutrition in 2016 found that cocoa extract had significantly reduced dental cavities when compared to water. That being said, since most cocoa products contain sugar, new cocoa products without sugar must be developed to experience the oral health benefits associated with cocoa. The polyphenols in cocoa have also been found to benefit your skin. Long-term cocoa congestion has also been found to improve skin blood circulation, contribute to sun production, and improve the hydration and surface texture of your skin. 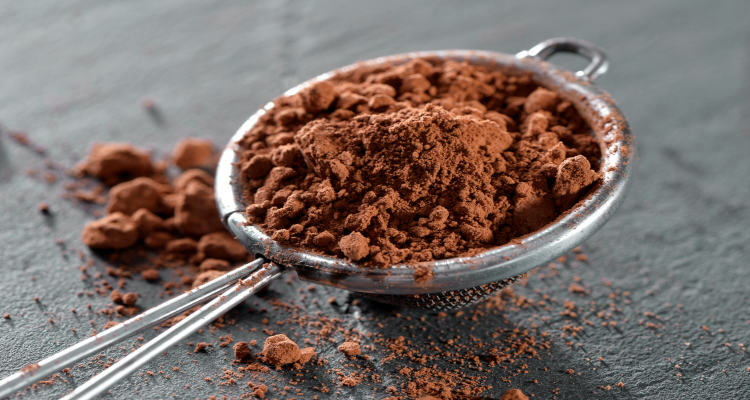 There are many undeniable health benefits of cocoa powder and dark chocolate, and although it is likely safe for most people, there are also cocoa powder side effects to consider. For instance, cocoa contains caffeine and related chemicals like theobromine that, in high amounts, may cause caffeine-related side effects like sleeplessness, nervousness, a fast heartbeat, and increased urination. Excessive cocoa consumption can also cause constipation, diarrhea, gas, stomach rumblings, intestinal pain, bloating, nausea, allergic skin reactions, bleeding disorders, blood sugar dysfunction, gastroesophageal reflux disease (GERD), and migraine headaches. Moreover, the caffeine in cocoa is associated with irritable bowel syndrome (IBS), osteoporosis, anxiety, and glaucoma. On top of that, overindulgence of chocolate is known to cause decreased bone density, kidney damage and disorders, weight gain, sleep disturbances, shakiness, jitteriness, neck pain, nervousness, swelling under the skin, and irregular heart rhythms. In addition, if you are allergic or intolerant to dairy, be sure to read labels and avoid cocoa products with milk. Due to the caffeine in cocoa, pregnant or breastfeeding women or women trying to become pregnant should also avoid consumption of large amounts of chocolate or cocoa. However, dark chocolate is considered safe for pregnant women when consumed in moderation. Again, the caffeine in cocoa may also interact with certain medications and increase the side effects of these drugs. Many of these drugs can reduce how quickly the body eliminates caffeine. You will want to avoid cocoa powder and chocolate if you take medications including: adenosine, clozapine, dipyridamole, ergotamine, lithium, phenylpropanolamine, antibiotics, birth control pills, cimetidine, disulfiram, fluconazole, mexiletine, verapamil, asthma medications like beta-adrenergic agonists, depression medications known as monoamine oxidase inhibitors (MAOIs), and estrogen pills like ethinyl estradiol, estradiol, and equine estrogens. Since too much chocolate may increase blood sugar, this may reduce the effectiveness of diabetes drugs as well. Because of the above side effects and drug interactions associated with cocoa powder and chocolate, avoid excessive amounts and consult your doctor if you consume cocoa powder or chocolate and also take any of the mentioned medications. Cocoa powder and chocolate are on the list of favorite foods for many people. This can be a good thing, since cocoa powder and chocolate have many important health benefits, including maintaining blood pressure, reducing the risk of stroke and heart attacks, boosting HDL cholesterol, improving brain function, reducing depression symptoms, improving symptoms of type 2 diabetes, benefiting skin and teeth health, and treating asthma. Many of the health benefits of cocoa powder are likely due to its impressive nutrition profile. Cocoa powder is especially high in protein, fiber, and minerals such as iron, copper, magnesium, and manganese. At the same time, cocoa contains caffeine and related chemicals like theobromine, and in high amounts, it may cause caffeine-related side effects and drug interactions. Consult your doctor to make sure your cocoa habit is not causing any side effects or interacting with your prescription. Black Beans vs. Pinto Beans: What Is the Difference between These Beans? “Theobroma cacao, the food of the gods,” Barry Callebaut; https://www.barry-callebaut.com/about-us/media/press-kit/history-chocolate/theobroma-cacao-food-gods, last accessed September 27, 2018. Garnsworthy, A., “The Different Varieties of Cocoa Beans: Criollo, Trinitario & Forastero,” Chocolate, Oct. 23, 2010; https://www.chocolate.co.uk/blogs/news/the-different-varieties-of-cocoa-beans-criollo-trinitario-and-forastero, last accessed September 27, 2018. Mandi, E., “11 Health and Nutrition Benefits of Cocoa Powder,” Healthline, August 9, 2018; https://www.healthline.com/nutrition/cocoa-powder-nutrition-benefits, last accessed September 27, 2018. Price, A., “8 Awesome Health Benefits of Dark Chocolate,” Dr. Axe, July 26, 2018; https://draxe.com/benefits-of-dark-chocolate/, last accessed September 27, 2018. “Cocoa, dry powder, unsweetened Nutrition Facts & Calories,” SELFNutritionData; https://nutritiondata.self.com/facts/sweets/5471/2, last accessed September 27, 2018. Ried, K., et al., “Effect of cocoa on blood pressure,” Cochrane Database of Systematic Reviews, April 25, 2017; 4:CD008893, doi: 10.1002/14651858.CD008893.pub3. De Araujo, Q., et al., “Cocoa and Human Health: From Head to Foot—A Review,” Critical Reviews in Food Science and Nutrition, 2016; 56(1): 1-12, doi: 10.1080/10408398.2012.657921. Ludovici, V., et al., “Cocoa, Blood Pressure, and Vascular Function,” Frontiers in Nutrition, Aug. 2017; 4: 36, doi: 10.3389/fnut.2017.00036. Kwok, C., et al., “Habitual chocolate consumption and risk of cardiovascular disease among healthy men and women,” Heart, Aug. 2015; 101(16): 1279-1287, doi: 10.1136/heartjnl-2014-307050. Hitti, M., “Cocoa Boosts “Good” Cholesterol,” WebMD, March 9, 2007; https://www.webmd.com/cholesterol-management/news/20070309/cocoa-boosts-good-cholesterol, last accessed September 27, 2018. Balch, J., et al., Prescription for Natural Cures: A Self-Care Guide for Treating Health Problems with Natural Remedies Including Diet, Nutrition, Supplements, and Other Holistic Methods (Hoboken: John Wiley & Sons, Inc., 2004), 181. Nehlig, A., “The neuroprotective effects of cocoa flavonol and its influence on cognitive performance,” British Journal of Clinical Pharmacology, March 2013; 75(3): 716-727, doi: 10.1111/j.1365-2125.2012.04378.x. Sorond, F., et al., “Cerebral blood flow response to flavonol-rich cocoa in healthy elderly humans,” Neuropsychiatric Disease and Treatment, April 2008; 4(2): 433-440, PMI: 18728792. Desideri, G., et al., “Benefits in cognitive function, blood pressure, and insulin resistance through cocoa flavonol consumption in elderly subjects with mild cognitive impairment: the Cocoa, Cognition and Aging (CoCoA) study,” Hypertension, Sept. 2012; 60(3): 794-801, doi: 10.1161/HYPERTENSIONAHA.112.193060. Mastroiacovo, D., et al., “Cocoa flavonol consumption improves cognitive function, blood pressure control, and metabolic profile in elderly subjects: the Cocoa, Cognition, and Aging (CoCoA) Study—a randomized controlled trial,” American Journal of Clinical Nutrition, March 2015; 101(3): 538-548, doi: 10.3945/ajcn.114.092189. Becker, K., et al., “Immunomodulatory properties of cacao extracts – potential consequences for medical applications,” Frontiers in Pharmacology, Dec. 2013; 4: 154, doi: 10.3389/fphar.2013.00154. Strandberg, T., et al., “Chocolate, well-being and health among elderly men,” European Journal of Clinical Nutrition, Feb. 2008; 62(2): 247-253, doi: 10.1038/sj.ejcn.1602707. Sokolov, A., et al., “Chocolate and the brain: neurobiological impact of cocoa flavonols on cognition and behavior,” Neuroscience and Biobehavioral Reviews, Dec. 2013; 37(10 Pt 2): 2445-2453, doi: 10.1016/j.neubiorev.2013.06.013. Ramos, S., et al., “Effects of Cocoa Antioxidants in Type 2 Diabetes Mellitus,” Antioxidants, Oct. 2017; 6(4), pil: E84, doi: 10.3390/antiox6040084. Martin, M., et al., “Potential for preventive effects of cocoa and cocoa polyphenols in cancer,” Food and Chemical Toxicology, June 2013; 56: 336-351, doi: 10.1016/j.fct.2013.02.020. Martin, M.A., et al., “Preventive Effects of Cocoa and Cocoa Antioxidants in Colon Cancer,” Diseases, June 22, 2016; 4(1), pil: E6, doi: 10.3390/diseases4010006. Maskarinec, G., “Cancer protective properties of cocoa: a review of the epidemiologic evidence,” Nutrition and Cancer, 2009; 61(5): 573-579, doi: 10.1080/01635580902825662. Awortwe, C., et al., “Unsweetened natural cocoa has anti-asthmatic potential,” International Journal of Immunopathological and Pharmacology, April to June 2014; 27(2): 203-212, doi: 10.1177/039463201402700207. Onatibia-Astibia, A., et al., “The potential of methylxanthine-based therapies in pediatric respiratory tract diseases,” Respiratory Medicine, March 2016; 112: 1-9, doi: 10.1016/j.rmed.2016.01.022. Heinrich, U., et al., “Long-term ingestion of high flavanol cocoa provides photoprotection against UV-induced erythema and improves skin condition in women,” Journal of Nutrition, June 2006; 136(6): 1565-1569, doi: 10.1093/jn/136.6.1565. Neukam, K., et al., “Consumption of flavanol-rich cocoa acutely increases microcirculation in human skin,” European Journal of Nutrition, Feb. 2007; 46(1): 53-56, doi: 10.1007/s00394-006-0627-6. “Cocoa,” WebMD; https://www.webmd.com/vitamins/ai/ingredientmono-812/cocoa, last accessed September 27, 2018.